To meet customer's requests, marketing departments are constantly asking to produce an ever increasing diversity of formats, colours and appearances. This ever increasing demand may work against the performance optimisation of production resources and material use. 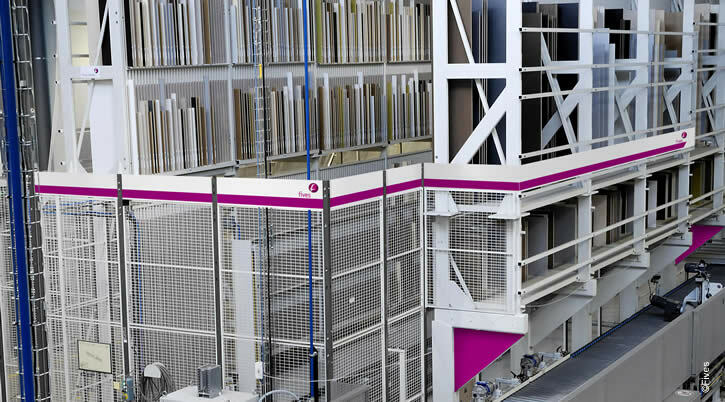 Board cutting, edge banding, frame assembly and logistics are all processes where performance is optimised through the specific sequencing of each production stage that can only be obtained by automation. Partner of major groups such as SALM and Fournier, Fives has developed a whole range of expertise and standard products for the specific needs of furniture, kitchen and bathroom that are made to order or store brands. Conveyors, robots, pullers, storage systems, AS/RS systems, stackers, numerical gantries, etc. Our innovative solutions, which are perfectly suited to the constraints of the wood industry, are based on the integration of proven standard products. Ideally installed at the end of the dege bander or saw, the Cinetic SmartSorterTM interfaces with your ERP to store and sort a choatic workpieces flow resulting from the optimisation of your cuttings, your edge bading constraints, quality control sampling, repairs and the reinsertion of the workpiece by the operator. Based on a patented principle of drive-through storage, the Cinetic SmartSorterTM makes the input and outflows independent to make it easy for you to sort your workpieces and organise your production. Roller conveyors, belt conveyors, track changers, sorters, etc. Fives has a comprehensive range of board conveyors ready to be integrated into your production lines. Thanks to our integration expertise, our knowledge of the wood industry and our dedicated range of grippers, we are able to provide you with highly efficient customised facilities for your storage, sorting, loading of machines and hardware bin picking operations. Used for stacking or loading saws and edge banders, the ETFA gantries are perfectly suited to the capacities and production speeds of the wood industry.